What does your smart car have to do with energy consumption? It’s all in the efficiency and effectiveness of energy use. At West Coast Solar, we strongly believe that renewable energy is the future of energy consumption. The benefits far outweigh the shortcomings. Nonetheless, on average, a fossil-fuel powered vehicle emits 4.6 metric tons of carbon emissions per year. There are an estimated 250 million cars active and in use in the U.S. alone. Some simple math shows us an estimated 1,150,000,000 metric tons of carbon emissions are emitted annually from just the U.S. This is the reason electric smart vehicles are so important. Are you ready to take the next step toward using renewable energy? Give West Coast Solar a call today! We serve Sacramento, San Jose, and the surrounding areas with solar power design, installation, financing and more. Otherwise, continue reading to learn more about smart grids and plug-in electric vehicles! There are several benefits to using electric vehicles, especially plug-in versions, when compared to internal combustion vehicles. A plug-in electric smart car has less maintenance cost, produces almost no air pollution, and reduce dependence on exhaustible fossil fuels. In most cases, electric vehicles are much more efficient when it comes to miles traveled per charge. 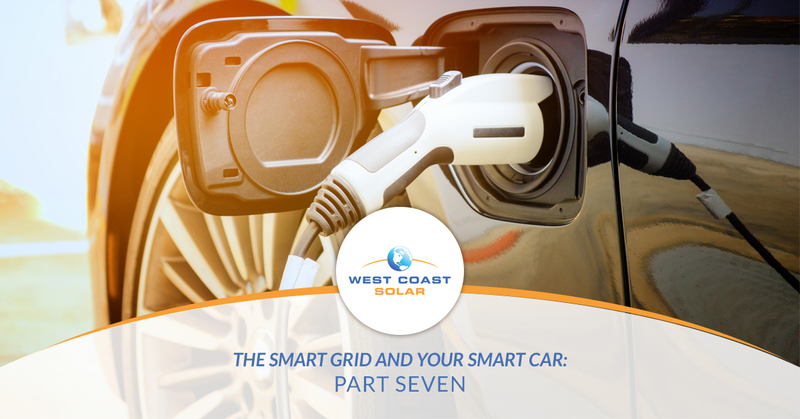 How does the smart grid affect electric plug-in vehicles? Unfortunately, current PEVs still require power plants to charge their batteries. Whether you see it or not, fossil-fuel power plants emit pollution when in operation. The introduction of smart grids will help reduce carbon emission substantially. A smart grid will enable the effective and efficient use of energy at all times of the day. The advanced monitoring and data collection systems will allow distribution operators to make better decisions on energy flow and management. This can all be tied to when and how a PVE is charged, whether at a residence or business. A simple example would be charging a PVE during the early morning hours when energy demand is low. This would reduce pollution emission from grid and power plant side of things while also getting an efficient charge on the consumer’s side, too. Why are electric vehicles important to energy consumption? The smart grid infrastructure is the key factor when it comes to energy consumption; it’s also a big influence on how we use energy today. The traditional energy system infrastructure hasn’t been updated in almost 100 years. A smart grid would allow more control and management over how and when we use energy. PVEs tie into the grid, and can theoretically operate as mobile energy systems. Their charged batteries can, technically, be used for other electrical needs, which could result in assisting consumers’ needs if brownouts or blackouts occur. If you’ve asked, “how will we keep all the electrical vehicles charged?”, you’re on the right track. Charging stations are popping up all over the nation to enable recharging. As the nation integrates smart grids and updated electric transmission components, the use of electric vehicles will rise as a “charge” will be more accessible. Energy consumption demands continue to grow as we move into the future. The information age is being experienced more on digital platforms and devices. This means that electricity is a high-demand product. Smart grids will no only address the collection of problems with traditional electrical grid systems, but they will contribute to the reduction of carbon emissions and help save the environment. Did you know you can use the energy produced from solar panels on your home or business to charge your electric car? Whether you have a PVE, PHEV, or a BEV, you can use the electricity generated from your renewable energy source —the sun— and power your vehicle. The abundance of electricity available to us via the sun or other renewable sources could power the world for centuries. Choose West Coast Solar for your solar system installation needs! Renewable energy is an ever-evolving technology. Advancements and upgrades emerge every year to assist in making our energy consumption more efficient and effective. As this process continues to mature, we’ll see pollution gradually plateau and then decline. At West Coast Solar, we’re proud to be a piece to the future puzzle that is renewable energy. Our mission is to serve those seeking a renewable energy production system like solar to power their homes, their businesses, and their lives. The less pollution we can create, the better our futures can be. Are you ready to discuss a solar power system for your home or business? Give us a call today! We serve Sacramento, San Jose, and the surrounding areas in California, and we look forward to serving you.